Thank you for that, and yes I have thought of all of these things many times over. When he approached me back in May with the idea of helping him build this, I snickered a bit. Yeah, right. He tried to sell me that it was “Something We Could Do Together”, painting for me a lovely Hallmark moment. Needless to say, I was skeptical. It felt a lot like he was trying to pull one over on the old man, that somehow he thinks he is just so darn charming that he’ll be able to get me to agree to do this? I also think that maybe he’s pushing my Daddy buttons a bit, knowing full well the power he wields with me. This power is the piece that I think about. Parents and grandparents and uncles and aunts of older kids all know that at some point the relationship with their child changes. The relationship becomes one that exists on their terms, not ours. They hold the reigns, the power. Now we continue to have strong influence for while, particularly as we are still paying their bills, but there is no doubt it changes, and it never goes back. Most of the summer passed, and I’d forgotten about his request. Maybe it was a joke. Maybe he was just testing me. Good one Ryan. But then, of course, one day he asks about it again. I am not going to easily get off the hook on this one. I think about the fact that he is a good, generally-cautious kid, and on most days I trust his judgment. I think about how little time I really have with him anymore – even when he’s home, he is hardly around. I think about the two of us making even a small memory, or giving him a good story to tell his friends – “Yes I got my dad to HELP me build this”. He’ll be a legend on the 3 West floor of Governor’s Hall at the University of Wisconsin Eau Claire, at least for a while. That made me smile. Ok, let’s do it. Now the important thing to note here, is that neither of us knows anything about woodworking, at all. We are completely winging it. He has really grandiose ideas about how fancy this thing should be, and many of these ideas are way beyond our capabilities. So we are in a constant tussle over what we are realistically going to be able to deliver, given our pedestrian skills. I don’t want to call anyone in to help us; it’s our project. Plus, this would only further expose my questionable choices. Finally we agree on a plan. Over five days we build the thing. We get frustrated with one another. We bicker some. I dropped and chipped a piece of glass he’s had specially cut to be an inlay. He continues to try to change the plan to make it fancier. I continually have to pull him back. 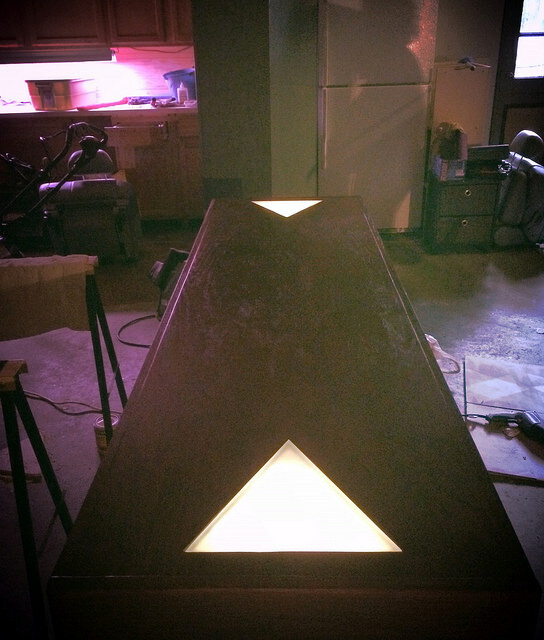 We used every single one of our powers, and it took us right up to his last day at home, but we finished it – a beautiful red oak pong table with frosted glass inlays, lit up from underneath. It is also designed to operate as a coffee table — hopefully 99.9% of the time. By then end we’d worked through our differences on how it should be done, and were operating as one. Not bad for a couple of duffers. The night before he went back to school, we went out for dinner for my birthday – the four of us and Emma. We got back to house and had dessert. Afterwards, I asked Ryan, “so you wanna give it a trial run?” He responded with an enthusiastic “Heck yeah”, and then searched my face a bit to see … maybe … is he … nope, and promptly filled the Red Solo cups with water. So we played two on two, Ryan and Emma against Jen and me. My wife was no help at all, by the way. It was competitive, for sure, with plenty of trash-talking on both sides of the table. Finally, younger bro Evan drilled the last two cups, standing in for Emma, and the parents were defeated. High fives all around. Family fun at its finest and most wholesome. Another grade-A memory in the books. So that is my confession, and I happily accept your judgment of my actions.